Young professionals of Sri Lanka’s shipping industry have come together to form a new association to develop the younger generation in the shipping and logistics sector. The Young Shipping Professionals of Ceylon Association of Ships’ Agents (CASA) will be launched in May 10 aimed at developing talent, skills and experiences of the youth membership of CASA, to meet the country’s future human resource needs in the rapidly evolving field of shipping and logistics, the young professionals said in. 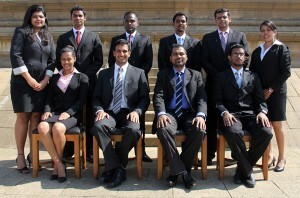 Pic shows members of the steering committee standing (from left) - Shalinie De Silva - McLarens Shipping (Assistant Secretary); Mahen Panagoda - Aitken Spence; Jehan Rodrigo – Prudential; Duminda Silva - Maersk (Assistant Treasurer); Nuwan Shanaka - Asha Agencies and Natarsha Fernando - Ceyline Shipping. Seated (from left) Kuvini Gamage - McLarens Shipping (Secretary), Mevan Peiris - Ceyline Group (Chairman), Navin Perera - GAC (Vice Chairman) and Hasitha Dissanayake - CMA CGM (Treasurer). “This move would create the environment for robust growth of this human resource pool in agency business in order to prepare our industry for the opportunities and challenges that lie ahead in our quest to become a regional shipping and maritime centre of excellence,” according to CASA Chairman Ralph Anandappa. Chairman of the Young Professionals of CASA, Mevan Peiris, says the new association within CASA would provide a unique and dedicated platform to identify and develop skills and experience needs of the next generation of Sri Lankan shipping professionals. “Our membership will be made up of persons below the age of 35 years, because we have identified the need for a focused thrust to meet development and growth needs of the younger generation. Through the Young Professionals of CASA, we hope to develop both professional and leadership skills that the local shipping industry will need as our economy expands under the Government’s plans to develop the country into a maritime hub,” explained Mr. Peiris in a media statement. “Our forum will create a platform for young people to learn new things and also to network and exchange ideas and experiences,” said Mr. Peiris. This will be achieved through interactive sessions, educational forums and visits, and lectures from foreign and local experts in the field. So far 102 people have registered to join the association.